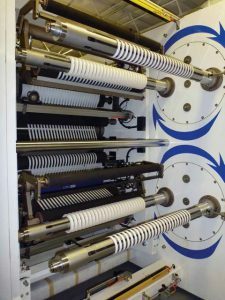 This automatic turret slitter has recently been supplied to our customer for the conversion of narrow width adhesive tapes, the machine consists of a shaftless unwind, web peel off roller, splice plate and web clamps, automatic tension control, automatic web guide, automatic slitter positioning, automatic core setting, facility for auto tape insertion for non-adhesive tapes. Rewinding on either airshaft or full differential shafts, automatic cut off and seal down of the tapes. Machine can be supplied in various widths from 800mm – 1300mm, multiple slitting options, range of rewind diameters, and core sizes, the maximum rewind diameter on this particular machine is 450mm.